Joel Luckhaupt is a statistician for Fox Sports Ohio and the coauthor of The Wire-to-Wire Reds: Sweet Lou, Nasty Boys, and the Wild Run to a World Championship. He has also served as contributing editor of the Maple Street Press Reds Annual. He lives in Cincinnati, Ohio. 100 Things Reds Fans Should Know & Do Before They Die was mentioned on the website for WXIX-TV, a Fox-TV affiliate. 100 Things Reds Fans Should Know & Do Before They Die was featured in the Middlesboro Daily News. They say, "It is a must-have addition to your library if you love baseball." Joel Luckhaupt, author of 100 Things Reds Fans Should Know & Do Before They Die, interviews live on "Ragz & The Bartender" on WAOR (South Bend, IN). Joel Luckhaupt, author of 100 Things Reds Fans Should Know & Do Before They Die, interviews live on "Sports Talk with Koza" on WWSR (Lima, OH). Joel Luckhaupt, author of 100 Things Reds Fans Should Know & Do Before They Die, interviews live on "Spadora on Sports" on WNER (Lowville, NY). 100 Things Reds Fans Should Know & Do Before They Die was featured in a giveaway on OMG Reds, a Cincinnati Reds blog. Joel Luckhaupt, author of 100 Things Reds Fans Should Know & Do Before They Die, was interviewed for Cincinnati Magazine. 100 Things Reds Fans Should Know & Do Before They Die was featured on Red Hot Mama, a Cincinnati Reds blog. The post included a listing of author Joel Luckhaupt's April 10 book signing event. 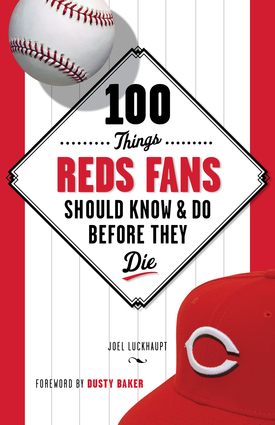 Watch WCPO-TV's interview with Joel Luckhaupt, author of 100 Things Reds Fans Should Know & Do Before They Die. 100 Things Reds Fans Should Know & Do Before They Die was mentioned on Cincinnati.com. The post included a listing of author Joel Luckhaupt's April 6 book signing event. Most Cincinnati Reds fans have taken in a game or two at the Great American Ball Park, have seen highlights of the Big Red Machine and remember the team's surprising 1990 World Series triumph. But only real Reds fans know which 15-year-old took the mound for the team in 1944, can name the pitcher who gave up Pete Rose's 4,192nd hit or remember how many dogs infamous Reds owner Marge Schott had. •	Obscure moments in team history with stories like the only woman to ever get an at-bat in the major leagues. •	Classic stories from former Reds superstars like Pete Rose, Barry Larkin and Joe Morgan. Whether you're a die-hard fan from the days of Sparky Anderson and Johnny Bench or a new supporter of Dusty Baker and Joey Votto - 100 Things Reds Fans Should Know & Do Before They Die is a fan-friendly guide to Redlegs baseball and the perfect book for fans' bookshelves.